I dreamed of my maternal grandmother last night. Typically, my dreams are comprised of mundane events; I'm cooking, shopping, walking through forests, taking a bath, attending a party. It sounds weird, but my dreams usually involve me living a normal life somewhere (and somewhen) else. Sometimes, people from my life will come into my dreams - friends from grade school, the occasional family member, but usually they're strangers to me. Last night was haunting, though. The dream has stuck with me all day. The details are fresh in my mind. My dream starts out with me in my grandmother's kitchen. Like she often used to do, my grandma is mixing up some powdered milk. As she turns to put her milk in the fridge, she takes a fall in the floor. Mind you, I never knew my grandma to be one for falls, but that's neither here nor there. As she falls, I can see the milk flying through the air and spilling all over us. I get down on my hands and knees and try to pick her up. No such luck, though - I can't get her off the floor. Then, as if I psychically broadcast a call for help, people from all points of my life begin to enter the room. Many of you probably reading this blog were surely there. Exhausted and in despair, I call out to everyone to help me get her up. Yet - no one can hear me. It's like they're phantoms passing through. Crying and still trying to get my grandma up, she looks over to me. "It's alright Jared, you've tried your best." I'm crying hard at this point. Eerily, I feel like I was really crying in my sleep; the sensation was that powerful. I lay across my grandma's chest, not understanding why I can't pick her up. Looking at her feet, I notice that they've disappeared. Steadily, my grandma is vanishing. As I look on in disbelief, I can see her eyes staring at me one last time. And with that... she's gone. I awoke in a cold sweat this morning, feeling quite peculiar. No... perhaps a better word would be shocked. My heart was racing; my neck was wet... and I've walked around all day feeling like I was hit by a ton of bricks. My maternal grandmother was always great to me. I can't think of a single memory that involves anything painful. The same goes for my grandpa; they were both incredibly kind to me. From what I know of them before my birth, I know they were different people. 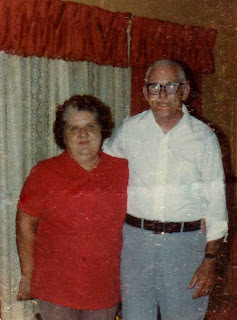 That being said, I have an understanding that grandma and grandpa changed in their later years. My grandmother and grandfather - Fannie Mae and Edward. If not for my grandma, I probably wouldn't have my deep love for baseball. We used to watch the Atlanta Braves games together on television. She loved the Braves (and the handsome Chipper Jones) and I'm a staunch St. Louis Cardinals fan. We'd get into some heated arguments about baseball, especially when the Cardinals were in town to play the Braves. I'd always accuse the Braves of using corked bats. To this day, I can still see grandma's face every time I'd tell her that (she'd sour up and scoff). To be honest, it was grandma and grandpa's fault that I'm a Cardinals fan anyway. 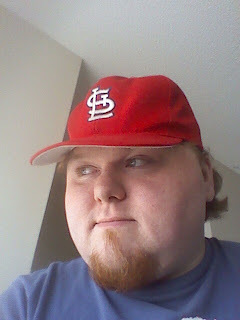 On a trip out west, they stopped in St. Louis and purchased my brother Josh and I Cardinals baseball caps. When they brought them back to us as souvenirs, I was hooked. Sitting at their kitchen table, I can still recall slipping that baseball cap on for the first time. Instantly, I was a Cardinals fan. As you can see, the old hat doesn't fit me too well anymore. My head (as you know from a previous blog post) is a little big for the cap these days. I've kept it clean and secure all these years, though. It means a lot to me. More than you might think. So here I am, left with a disturbing dream and stirred memories. That's nothing new in my book.